Production Central, the main entrance to Universal Studios Florida, is the gateway that welcomes guests to the “working” film studio. Soundstages line the streets of this bustling backlot, and visitors navigate their way through the park on streets with Hollywood-inspired names including Sunset Boulevard and Plaza of the Stars. The Universal Music Plaza Stage in this area of the park hosts a number of concerts throughout the year, most notably during the park’s Mardi Gras event and the Summer Concert Series. Attractions in Production Central include Shrek 4-D, Despicable Me Minion Mayhem, Hollywood Rip Ride Rockit, and TRANSFORMERS: The Ride – 3D. If hungry, guests can stop by the Universal Studios’ Classic Monsters Café for lunch or dinner or by Studio Sweets for assorted candies and homemade baked goods. Shopping opportunities in Production Central include the Universal Studios Store, It’s a Wrap, Shrek’s Ye Olde Souvenir Shoppe, On Location, Despicable Me’s Super Silly Stuff, and Transformers’ Supply Vault. 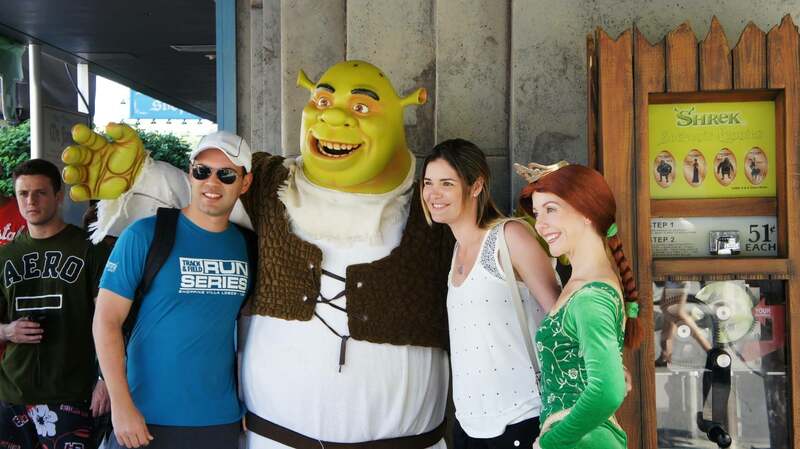 Shrek and friends in the Production Central area of Universal Studios Florida. Below you can check out our interactive map of the area. When you are ready to learn more, use the navigation links at the top or bottom of the page to explore the individual attractions.